Victorias's Ambulance Service has its origins in a public meeting in Melbourne on June 13, 1883, when it was decided as many people as possible should be taught first aid and home nursing. Today's service is a far cry from such humble beginnings, boasting the latest in technology and quick response time across the State. ​The actual foundation for the professional Ambulance Service of today were laid over 100 years ago in 1887, when as a result of careless handling, needless suffering was caused to people who were injured as a result of the accidents. Lack of a suitable means of transporting patients accentuated the suffering caused, due to the common practice of placing any person found injured in a cab or other handy vehicle for the journey to the hospital. Severe aggravation of the patient's condition, or even death, was not uncommon in these circumstances. In the early days, patient transport was usually a door taken off its hinges or a rough ride in a horse drawn cab to the nearest hospital. Although a St John Ambulance Association had been formed in 1883 and was active in the teaching of first aid, it was not until 1887 that Lady Janet Clarke, wife of the President of the St. John Ambulance Association, together with a band of volunteers raised sufficient funds to purchase six 2 wheeled "Ashford Litters". These were little more than stretchers with wheels attached. However, their distribution to Police Stations in Melbourne did mark the first attempts at an Ambulance Service, but were not widely used until a Litter was located at the Eastern Hill Fire Station in 1896. When required, a police officer would trundle along the road with the patient on the stretcher. Little or no first aid was given except on a hot day, when the Frst Aid Constable would stop at the local hotel for a cold ale to relieve or revive both himself and the patient! The older practice of using Hansom Cabs for transport continued for some time. The first step towards the formation of an independent Ambulance Service took place when one of the Ashford Litters was placed at the Metropolitan Fire Brigade Station at Eastern Hill under the control of Chief Officer Stein. Manned by fireman, this stretcher was called out over 100 times in the first 12 months. With this rapid increase in demand, a suggestion was put forward by Mr. Stein that a horse-drawn ambulance be obtained. In 1899 a wagon was borrowed from the Defence Department and tried as an ambulance. While the wagon was a great improvement on the Ashford Litter, it proved to be too heavy and unwieldy and it became necessary to look for a lighter and more suitable vehicle. A group of Melbourne ladies, led by Mrs L.J Bevan and Mrs. J.E. Niels, who called themselves "The Daughters of the Court", raised the necessary funds to purchase the first true horse-drawn ambulance in 1899. This vehicle continued to operate out of Eastern Hill and its first year attended over 400 cases. ​The success of the ambulance must have exceeded the ability of the Metropolitan Fire Brigade to staff it, as they demanded a fee of $300 for out of pocket expenses associated with the vehicle. This demand for a fee caused problems for the St John Ambulance Association, as they had no funds available to reimburse the Metropolitan Fire Brigade. A conference of municipalities was called to discuss the maintenance of the Ambulance Service. The conference met in 1900 and although it did not offer any funds to the Metropoitan Fire Brigade, it did request that the ambulance service be continued. The Melbourne City Council did agree to provide $150 per year to help maintain the service. In July 1901, it became apparent that the MFB was not interested in continuing the ambulance service without reimbursement of expenses, as they advised the St John Ambulance Association that the service would be discontinued from the October of that year. It was eventually terminated on December 31st, 1902. ​In 1909, Kellow Motors (now known as KellowFalkner) wrote to St John'sv offering a Renault "10-14 h.p.2 cylinder motor chassis fitted with tyres for $640, plus $20 for freight. In April 1910 an order was placed for the vehicle and it entered service on October 25th, 1910. This vehicle was the foundation for the present fleet of ambulances. The year 1909-10 saw 4304 calls attended. The motor ambulance attended 694 calls in its first six months of operation. ​Additional motor ambulances were placed in service in September, 1911 and March 1913. The headquarters of the service moved to rented premises at 463 Swanston Street, on the corner of Franklin Street, opposite the City Baths. ​In 1914, the State Government made its first gran to the service of $500. Despite this the financial state of the service continued to be serious. The outbreak of war in Europe provided an impetus for increased first aid training, however the ambulance service did not receive any additional aid and continued to deteriorate financially. 1916 saw St John's Ambulance Ambulance split its functions and the Victorian Civil Ambulance Service (V.C.A.S.) was formed, solely relying on public donations and municipal council financial support as the then State Government refused to subsidise the ambulance service, unlike the statewide police and fire brigades. However in 1918, a serious outbreak of influenza in Victoria made the ambulance service essential and with Public Health Department funding the epidemic, staff rose to 85 drivers and attendants and the fleet increased to 16 cars and horse drawn vehicles. ​​In 1923 the fleet comprised 6 motor vehicles, a motor cycle and sidecar, 3 horse drawn ambulances and 27 operational staff. Country services in Yarram, Yarra Junction and Rushworth began. 1925 saw the end of the horse drawn ambulance era. In 1944 some ambulances received one way radio transmissions. 1946 saw the entire fleet of 27 vehicles fitted with radio receivers. In 1954 two way radios were fitted to the fleet and the first communications centre began operation. ​1962 brought the beginning of air ambulance service. 1969 the first specifically developed ambulance, the Ford F100 Series went into service. In October 1970 Melbourne experienced Australia's worst bridge disaster - the collapse of the huge Westgate Bridge under construction. 37 men lost their lives. The V.C.A.S. played the major medical role in this disaster and many attending officers can still recount this tragic event today. In 1971 the Mobile Intensive Care ambulance (MICA) concept was trialled successfully. 1986 helicopter retrieval of trauma and time critical patients began. The 1990's heralded the division of non-emergency patient transport services and MICA paramedics increased from 75 to 126 with 12 new emergency ambulance stations, computer assisted dispatch and advanced medical priority and communication systems and the Victorian Ambulance clinical information system rolled out statewide. Note: Victoria was the first state in Australia to introduce helicopter air ambulances, and the first state in Australia (and only the second jurisdiction world wide) to introduce the MICA ambulance concept. ​Photo above: Chas Martin, Manager & Curator, standing next to a 1963 Ford F100 Owner Rural Ambulance Vic. ​​When Chas Martin joined the Victorian Civil Ambulance Service in 1962, there were just 28 ambulances on the streets on Melbourne. Mind you, the last horse-drawn ambulances had only been withdrawn from service in 1925, and the first radios were fitted to cars as late as 1944. By 2005, Chas and his team (through Ambulance Victoria which owns all the vehicles and displays) had managed to acquire a factory in Thomastown, and in 2007 the Ambulance Museum Victoria was opened. “Even though it’s listed on Ambulance Victoria’s records as a storeroom,” Chas laughs. The museum has about 20 ambulances, ranging from a 1916 Talbot and a 1927 Nash up to the modern-day equivalents and everything in between. It also houses a huge range of equipment, uniforms and memorabilia, as well as human-powered wheeled carts that were the first form of dedicated patient transport in Victoria. When not on display at the museum, the ambulances are often used for TV shows and movies needing period-correct vehicles. Chas is the Museum’s Manager & Curator and still chases collectible ambulances around the country. In the early 1990's a group of retired ambulance officers identified the need to preserve Victoria's ambulance history. ​Meetings were held and soon after the Ambulance History Society of Victoria Inc (A.H.S.) was formed. 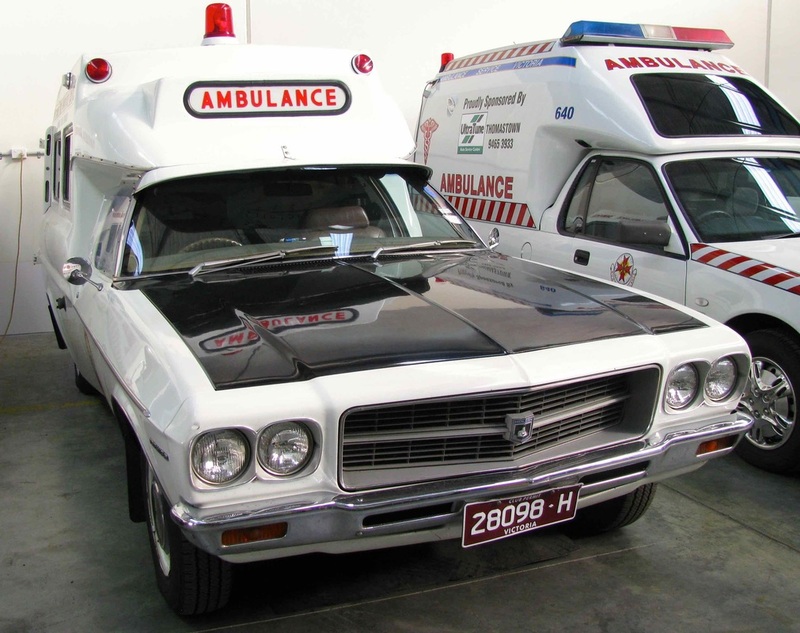 With grateful financial assistance and support from Ambulance Victoria, the museum entered its infancy, And so began the search for suitable vintage ambulances, equipment and memorabilia, often beyond the bounds of Victoria. There are now 20 vehicles in the museum and the oldest vehicle is a 1916 Talbot & includes a room of memorabilia. If you see any old ambulance vehicles that need a good home or need to be restored, please contact Chas Martin. 55 Barry Street, Bayswater, Victoria 3153. Previously in Thomastown. Opening hours: Monday to Friday, 9 am to 2 pm. Group bookings can be organised. The Ambulance Historical Society of Victoria also maintains a collection of memorabilia, photographs and archives relating to the development and history of Victoria’s Ambulance services. These can be made available to researchers on an appointment basis only. Membership of the Ambulance Historical Society of Victoria is open to serving and retired paramedics, ambulance officers, Ambulance Service employees, their families and interested members of the public. Photos taken by Cartalk. 1942 Chevrolet, 1957 Ford Mainline, 1972 HQ Holden, 1963 Ford F100, 1927 Nash. Source: History and content about Ambulance Victoria provided by Chas Martin in June 2016.